Popular Item:Choice of PolySteel or Composite Handle (Green Only) 54" Length, Long Lasting, Lightweight & Colorful. Bunker rakes with Teardrop Design - adds strength and rigidity to the sand rake head. Tine Configuration with long tines dig deep to remove footprints and impact craters faster. Short tines groom the trap for maximum smoothness and better play. Safer Handles - Wont's crack or splinter. Economical Dollar for dollar. "SmartComb will out-perform any bunker rake in golf". 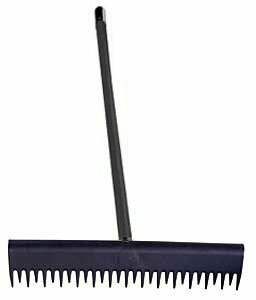 *Replacement Heads & Handles Available for these sand trap rakes. Note: Additional shipping charges apply. Add to cart for estimate.